Acts 16:6 When they had gone through the region of Phrygia and Galatia, they were forbidden by the Holy Spirit to speak the word in Asia. Acts 18:23 Having spent some time there, he departed, and went through the region of Galatia, and Phrygia, in order, establishing all the disciples. 1 Corinthians 16:1 Now concerning the collection for the saints, as I commanded the assemblies of Galatia, you do likewise. 2 Timothy 4:10 for Demas left me, having loved this present world, and went to Thessalonica; Crescens to Galatia, and Titus to Dalmatia. IV. PAUL'S USE OF "GALATIANS"
To designate a large province of the Roman empire, including not merely the country Galatia, but also Paphlagonia and parts of Pontus, Phrygia, Pisidia, Lycaonia and Isauria. The name occurs in 1 Corinthians 16:1 Galatians 1:2 1 Peter 1:1, and perhaps 2 Timothy 4:10. Some writers assume that Galatia is also mentioned in Acts 16:6; Acts 18:23; but the Greek there has the phrase "Galatic region" or "territory," though the English Versions of the Bible has "Galatia"; and it must not be assumed without proof that "Galatic region" is synonymous with "Galatia." If e.g. a modern narrative mentioned that a traveler crossed British territory, we know that this means something quite different from crossing Britain. "Galatic region" has a different connotation from "Galatia"; and, even if we should find that geographically it was equivalent, the writer had some reason for using that special form. The questions that have to be answered are: (a) In which of the two senses is "Galatia" used by Paul and Peter? (b) What did Luke mean by Galatic region or territory? These questions have not merely geographical import; they bear most closely, and exercise determining influence, on many points in the biography, chronology, missionary work and methods of Paul. II. Origin of the Name "Galatia." The name was introduced into Asia after 278-277 B.C., when a large body of migrating Gauls (Galatai in Greek) crossed over from Europe at the invitation of Nikomedes, king of Bithynia; after ravaging a great part of Western Asia Minor they were gradually confined to a district, and boundaries were fixed for them after 232 B.C. Thus, originated the independent state of Galatia, inhabited by three Gaulish tribes, Tolistobogioi, Tektosages and Trokmoi, with three city-centers, Pessinus, Ankyra and Tavia (Tavion in Strabo), who had brought their wives and families with them, and therefore continued to be a distinct Gaulish race and stock (which would have been impossible if they had come as simple warriors who took wives from the conquered inhabitants). The Gaulish language was apparently imposed on all the old inhabitants, who remained in the country as an inferior caste. The Galatai soon adopted the country religion, alongside of their own; the latter they retained at least as late as the 2nd century after Christ, but it was politically important for them to maintain and exercise the powers of the old priesthood, as at Pessinus, where the Galatai shared the office with the old priestly families. The Galatian state of the Three Tribes lasted till 25 B.C., governed first by a council and by tetrarchs, or chiefs of the twelve divisions (four to each tribe) of the people, then, after 63 B.C., by three kings. Of these, Deiotaros succeeded in establishing himself as sole king, by murdering the two other tribal kings; and after his death in 40 B.C. his power passed to Castor and then to Amyntas, 36-25 B.C. Amyntas bequeathed his kingdom to Rome; and it was made a Roman province (Dion Cass. 48, 33, 5; Strabo, 567, omits Castor). Amyntas had ruled also parts of Phrygia, Pisidia, Lycaonia and Isauria. The new province included these parts, and to it were added Paphlagonia 6 B.C., part of Pontus 2 B.C. (called Pontus Galaticus in distinction from Eastern Pontus, which was governed by King Polemon and styled Polemoniacus), and in 64 also Pontus Polemoniacus. Part of Lycaonia was non-Roman and was governed by King Antiochus; from 41 to 72 A.D. Laranda belonged to this district, which was distinguished as Antiochiana regio from the Roman region Lycaonia called Galatica. This large province was divided into regiones for administrative purposes; and the regiones coincided roughly with the old national divisions Pisidia, Phrygia (including Antioch, Iconium, Apollonia), Lycaonia (including Derbe, Lystra and a district organized on the village-system), etc. See Calder in Journal of Roman Studies, 1912. This province was called by the Romans Galatia, as being the kingdom of Amyntas (just like the province Asia, which also consisted of a number of different countries as diverse and alien as those of province Galatia, and was so called because the Romans popularly and loosely spoke of the kings of that congeries of countries as kings of Asia). The extent of both names, Asia and Galatia, in Roman language, varied with the varying bounds of each province. 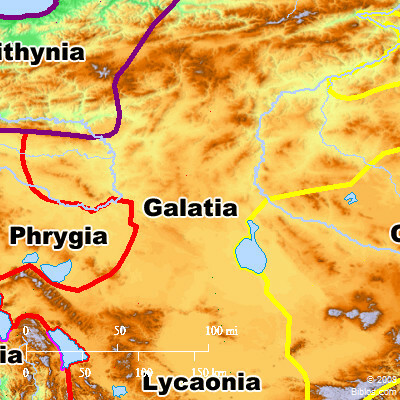 The name "Galatia" is used to indicate the province, as it was at the moment, by Ptolemy, Pliny v.146, Tacitus Hist. ii0.9; Ann. xiii. 35; later chroniclers, Syncellus, Eutropius, and Hist. Aug. Max. et Balb. 7 (who derived it from earlier authorities, and used it in the old sense, not the sense customary in their own time); and in inscriptions CIL, III, 254, 272 (Eph. Ep. v.51); VI, 1408, 1409, 332; VIII, 11028 (Mommsen rightly, not Schmidt), 18270, etc. It will be observed that these are almost all Roman sources, and (as we shall see) express a purely Roman view. If Paul used the name "Galatia" to indicate the province, this would show that he consistently and naturally took a Roman view, used names in a Roman connotation, and grouped his churches according to Roman provincial divisions; but that is characteristic of the apostle, who looked forward from Asia to Rome (Acts 19:21), aimed at imperial conquest and marched across the Empire from province to province (Macedonia, Achaia, Asia are always provinces to Paul). On the other hand, in the East and the Greco-Asiatic world, the tendency was to speak of the province either as the Galatic Eparchia (as at Iconium in 54 A.D., CIG, 3991), or by enumeration of its regiones (or a selection of the regiones). The latter method is followed in a number of inscriptions found in the province (CIL, III, passim). Now let us apply these contemporary facts to the interpretation of the narrative of Luke. III. The Narrative of Luke. (7) progress across the region Pisidia, where no churches were founded (Pisidian Antioch is not in this region, which lies between Antioch and Pamphylia). (2) Phrygia. On this occasion he specially appealed, not to churches as in 16:6, but to disciples; it was a final visit and intended to reach personally every individual, before Paul went away to Rome and the West. On this occasion the contribution to the poor of Jerusalem was instituted, and the proceeds later were carried by Timothy and Gaius of Derbe (Acts 20:4; Acts 24:17 1 Corinthians 16:1); this was a device to bind the new churches to the original center of the faith. These four churches are mentioned by Luke always as belonging to two regiones, Phrygia and Lycaoma; and each region is in one case described as Galatic, i.e. part of the province Galatia. Luke did not follow the Roman custom, as Paul did; he kept the custom of the Greeks and Asiatic peoples, and styled the province by enumerating its regiones, using the expression Galatic (as in Pontus Galaticus and at Iconium, CIG, 3991) to indicate the supreme unity of the province. By using this adjective about both regiones he marked his point of view that all four churches are included in the provincial unity. From Paul's references we gather that he regarded the churches of Galatia as one group, converted together (Galatians 4:13), exposed to the same influences and changing together (Galatians 1:6, 8; Galatians 3:1; Galatians 4:9), naturally visited at one time by a traveler (Galatians 1:8; Galatians 4:14). He never thinks of churches of Phrygia or of Lycaonia; only of province Galatia (as of provinces Asia, Macedonia, Achaia). Paul did not include in one class all the churches of one journey: he went direct from Macedonia to Athens and Corinth, but classes the churches of Macedonia separate from those of Achaia. Troas and Laodicea and Colosse he classed with Asia (as Luke did Troas Acts 20:4), Philippi with Macedonia, Corinth with Achaia. These classifications are true only of the Roman usage, not of early Greek usage. The custom of classifying according to provinces, universal in the fully formed church of the Christian age, was derived from the usage of the apostles (as Theodore Mopsuestia expressly asserts in his Commentary on First Timothy (Swete, II, 121); Harnack accepts this part of the statement (Verbreitung, 2nd edition, I, 387; Expansion, II, 96)). His churches then belonged to the four provinces, Asia, Galatia, Achaia, Macedonia. There were no other Pauline churches; all united in the gift of money which was carried to Jerusalem (Acts 20:4; Acts 24:17). IV. Paul's Use of "Galatians." The people of the province of Galatia, consisting of many diverse races, when summed up together, were called Galatai, by Tacitus, Ann. xv0.6; Syncellus, when he says (Augoustos Galatais phorous etheto), follows an older historian describing the imposing of taxes on the province; and an inscription of Apollonia Phrygiae calls the people of the city Galatae (Lebas-Waddington, 1192). If Paul spoke to Philippi or Corinth or Antioch singly, he addressed them as Philippians, Corinthians, Antiochians (Philippians 4:15 2 Corinthians 6:11), not as Macedonians or Achaians; but when he had to address a group of several churches (as Antioch, Iconium, Derbe and Lystra) he could use only the provincial unity, Galatae. All attempts to find in Paul's letter to the Galatians any allusions that specially suit the character of the Gauls or Galatae have failed. The Gauls were an aristocracy in a land which they had conquered. They clung stubbornly to their own Celtic religion long after the time of Paul, even though they also acknowledged the power of the old goddess of the country. They spoke their own Celtic tongue. They were proud, even boastful, and independent. They kept their native law under the Empire. The "Galatians" to whom Paul wrote had Changed very quickly to a new form of religion, not from fickleness, but from a certain proneness to a more oriental form of religion which exacted of them more sacrifice of a ritual type. They needed to be called to freedom; they were submissive rather than arrogant. They spoke Greek. They were accustomed to the Greco-Asiatic law: the law of adoption and inheritance which Paul mentions in his letter is not Roman, but Greco-Asiatic, which in these departments was similar, with some differences; on this see the writer's Historical Commentary on Galatians. GALA'TIA, the central province of Asia Minor, but its boundaries changed several times. It is high table land. It is sufficiently defined upon the map.